Let’s get the important stuff over with right up front. . . . This is one gorgeous book cover! If you’re the type of person who buys a book based on the cover…then here you go. This particular cowboy, with those devastating blue eyes, should have this book flying off the shelves. But while it’s fun to dish about cute guys on the front of a book, how many of you would really buy a book for that reason alone? There’s so much more to this book than just the good looking guy. There’s a very believable cowboy suffering from an emotionally painful, very real and heart-wrenching disorder. My favorite books to read, whether historical or contemporary, are always set in small towns. The cozy hometown feel has such an appeal to me. I love the fact that everyone knows each other, went to school together, and watches each others’ kids grow up. They band together to celebrate the wonderful things and they help each other through the tough times. Yes, you have your quirky characters, snooty characters, busy-bodies, and the occasional bad guy. But those are all the special extras that give a book its flavor. Lucky for me, Jenna’s Cowboy is set in just such a town. 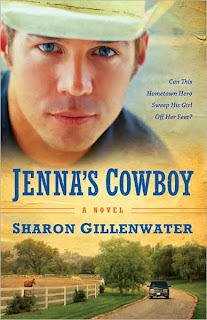 Actually, the setting is based on author Sharon Gillenwater’s actual hometown, in West Texas. Maybe that’s why it curled all the way around my heart as I read it. Or maybe it’s the truly wonderful spirit Sharon creates in her characters. Not that they’re perfect. Like all satisfying books, her characters must experience the ups and downs of life and grow stronger in both in spirit and in faith. It’s because of those characters and the way Sharon shapes them that I always look forward to her books. Nate Langley is a hometown hero. And he’s a true-blue Christian romance novel hero, the kind of hero that makes even the most cynical heart melt. Of course, he doesn’t want any special recognition for the sacrifices he made while serving his country. He did what any man who loves his country would do. But now it’s time to come home and help his father run the farm, time to be a cowboy, and though he might not know it yet, it’s time for Nate to heal. It might even be time to win the heart of one very special woman—the woman he’s been in love with since he was fifteen years old. Jenna Callahan Colby is a woman who also has a lot of healing to do. She knows first hand the pain of betrayal. Could Nate possibly be the cowboy who can help her through it? Right at the beginning of the book as Nate watches Jenna interact with some local teenagers, this book stole my heart. Actually, it gripped me even before that, when I read the very special dedication at the beginning of the book followed by the beautiful passage from Isaiah. Post Traumatic Stress Disorder, the pain of divorce and betrayal, trusting the Lord to get through it all... All are very serious, very real issues, and Sharon handles them with the tenderness and sensitivity they deserve. She gives readers a deeper understanding for the effect war has on our young men and women, all the while leading us down the path of a blossoming romance. This book is filled with heart-warming scenes and heart-aching scenes. I found my eyes filling with tears more than once. When Jenna and Nate meet for the first time in the book, I couldn’t help but smile. It takes a special writer to blend serious issues with heartwarming romance and a touch of humor, and Sharon Gillenwater is just such an author. If you’ve read her books before, you know you’re about to read something special. If you’ve never read one of her books, you truly won’t want to miss this one. Her book Love Song remains one of my all time favorites, but I think Jenna’s Cowboy may have just pushed that one into second place. I hope you’ll grab a copy of Jenna’s Cowboy, settle into your favorite reading spot, and let the entire world fade away while you escape to Small-Town-USA…my favorite place to be. Be sure and leave a comment (with your e-mail address so I can contact you if I choose your name) for a chance to receive an autographed copy of Jenna’s Cowboy. I’ll choose a name on Sunday night at 6pm PST and announce it here. Sharon Gillenwater was born and raised in west Texas, and loves to write about her native state. Jenna’s Cowboy is her nineteenth published novel. She’s written for both the ABA and CBA, with settings ranging from Regency England and Scotland to Texas in the 1880’s and modern day Texas. When she's not writing, she and her husband enjoy spending time with their son, daughter-in-law, adorable grandson, and precious granddaughter. Good morning Suzie, Inkies, and Inkettes. I'm glad you chose this book, Suzie. Actually, I wouldn't have picked it up off the shelf because I would have figured another cowboy romance was the last thing I wanted to read. But...post traumatic stress disorder. Now that's a different story. I'm fascinated with stories about soldiers dealing with real life after surviving a war. Thanks for the info on this book. It sounds interesting! Looks like a fun book! I'll have to put it on my ever-growing list of books to hunt down! Karen, I'm so glad you stopped by this morning. D'Ann, it is a fun book. Sharon is a master at subtle humor. How she manages to mix it with such serious subjects is a mystery. My two favorite types of books - true romance, and real-life issues - blended into one captivating book. As a former member of the CAF, I like reading 'soldier' stories so this one's right up my alley. Anita, I don't buy for a cover alone, either. But ya have to admit...this one's good. I love soldier stories, too, and I do believe you will love this book. Karen K., thanks for stopping by today. I do hope you get to read the book, because I know you'll enjoy it. Ladies, the sun is shinging today, for real. Not just a five minute peep show like yesterday. This is the first sunshine in weeks, so I am going for a drive with hubby and will check back in with you all later in the afternoon. Have a blessed day. Great post. I echo everyone elses sentiments. I love that cover too. The sun also rises in cincy today and I'm going for a walk. What a relief. :) Enjoy. This one does sound fun, and a little different! Yes, yummy cover. Thanks for introducing me to a new author! I am very empathetic to anyone who suffers the effects of wartime. Whether they served in the armed forces, or they are a loved one or family member, I keep them all in my prayers. World War II, The Korean War, Vietnam, The Gulf War, and the current War on Terrorism. I have friends and family from all of those groups who have so gallantly served our country. They all remain affected by their wartime experiences. Some hide it better than others, but the horror never really leaves. Please keep our armed service members and their loved ones in your prayers. Virginia, you are so right. We know they are heroes, but that doesn't mean they don't also need to be cared for when they come home. This is a fascinating twist to an age old formula. Kudos. A shout out to our friend from down under. Narelle gets cooler weather and we get warmer and we're all happy. Hi Virginia. Thanks for commenting. We miss you when you don't. Scary, huh? Suzie, thanks for the great review, and for introducing me to a new author. The story sounds wonderful and rich, and you're right: this cover is quite easy on the eyes. One more for my TBR list! Ladies, thank you all for your comments. I'm so sorry I couldn't get back to the computer to answer them all, but I am so glad you all stopped by. Narelle is the winner of the autographed copy of Jenna's Cowboy. I hope the rest of you will get the opportunity to read this book.